So, you took a Great Photo and now you want to turn it into a photo stencil so that you can create some cool art with it. That’s easy! You will need to breakdown your photo into layers. Layers relate to how much detail you want in your image. If you just want the silhouette of the image in the photo that’s easy. Just outline the image and cut out your stencil. But if you want a little more detail than you’ll need to break your photo down into layers. Let’s follow a photo stencil transition that will fall somewhere in the middle. That way you can adjust these procedures for your project. And after you follow along with this photo stencil project don't miss the video below! The best images have high contrast with few variations. 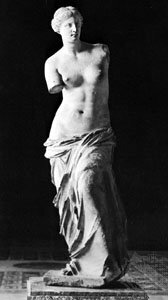 I'm using this photo of The Venus de Milo. Since she is made of marble, she relates well to a black and white image. That makes it easy for me to break her into two overlays with just highlights and shadows. And a great place to show you just how to break an image down into layers - the first step of making stencils. 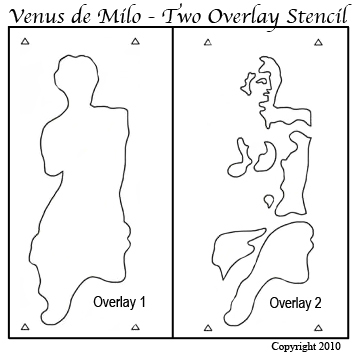 Here is the photo I am using: The Venus de Milo. If your image has a lot of colors and depth and you need to simplify it, put it on a copy machine and get a black and white print of it. Don’t worry if it isn’t as pretty as the original image. You will be adding color back to it when you have your photo stencil pattern. Take your black and white image to your drawing table or desk. Top your image with a piece of thin tracing paper and begin to create an outline separating the dark and light areas. Take the term “separating” seriously. Shaded areas should have clear boundaries if at all possible because bridges need to be built around the islands or openings where paint is to be applied. Notice how layer one is the whole of the statue and layer two works in the shadows. Paint layer one with a very soft gray and layer two with a little darker. Below is the picture of the painted photo stencil. This is a great way to start a photo stencil. Imagine you want to add eye color or hair color. Just add a layer. Get the idea. This is just basic but you can apply these rules to your photo. OK! Have you been asking, "What are those obnoxious triangles in the corners of each sketch?" Well, I'm glad you asked. Those are registration marks or points. This is how you will line up each overlay to make sure that your paint layers are exactly where they need to be. Just cut out the triangles and when you have your first stencil overlay lined up and secured in place, mark the registration points using a pencil. Then lay the next overlay so that the marks line up. Never paint inside the registration points because they are not a part of your design and you will need to eliminate them when the art is done. When making stencils, design in the registration marks on your outline so you can have them exactly aligned on each of the overlays that you trace off of the original. I have made the triangles bigger than I normally would on the examples used here to make them stand out and to get your attention. They can be smaller or even a different shape. Whatever, is going to work best for you. I just find that cutting three short lines is easier than trying to cut out a nice circle. Now you have your overlays. Click here for hints on Long-Term Stencil Making. I have a few tips to help you prepare your overlays to be saved for future use. Excellent! It’s time to put paint to your stencil. You should be a pro at this by now but if you need help or want to review, go to How to Stencil for the details. Here is what my painted Venus de Milo looks like. Keep in mind the colors that you are going to use. This was a pretty simple two overlay stencil As you start adding more dimensions and overlays the more complicated it gets. I prefer to have a separate overlay for each color. It just keeps things simple and you don’t have to worry about the wrong paint getting into an island where it’s not supposed to be. Of course, that means more overlays and more cutting. However, this extra work in the beginning makes your painting go smoother and that usually results in less mistakes. So, designing and making a photo stencil of your own can be simplified by creating an overlay for each color needed. You may end up with more overlays, but the stencil painting process will be easier. Well, you've taken your hobby of stenciling one step further by making stencils from your own photo. I know that sometimes when I get to the drawing table and try to break a sketch down into layers I end up rubbing my head. But I persevere and it all comes together. I hope you had a great time learning How to Make a Stencil from your photo. 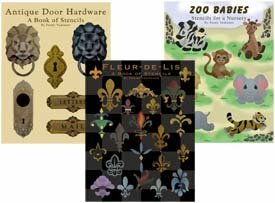 You may get the idea that you can use these techniques to copy a Masterpiece and do some Fine Art Stenciling. This plan will work for any image not just photos, so start thinking about all the beautiful Stencil Art you can create. P.S. We are thrilled to introduce our selection of downloadable and printable Stencil Designs. Instant gratification at its finest! You don't need a special printer - these designs are specially formatted to print from your home computer on standard letter sized paper. Once downloaded, you will have your complete stencil booklet with patterns and instructions. Just click, buy and print! Return to Home Page from Photo Stencil. Return to How to Make a Stencil from Photo Stencil.